In a bowl combine 1 cup cooked chicken, 2 chopped tomato,1 1/2 cup sheredded lettuce, 1/2 cup cooked crumbled bacon. Mix the meat and vegetables with 1/4-1/2 cup mayo. Mix well. Add salt and pepper to taste. Place a little mayo on a 10 inches flour tortilla. 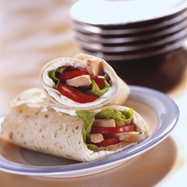 Add some of the salad on the tortilla and roll. Cut in an angle. Sereve immediately.